Jamberoo Abbey 09 (33), originally uploaded by Court Jester2. I walked the same road at least eight times a day for three days. Not a massive walk at about 370 metres in length, but not ordinary either! 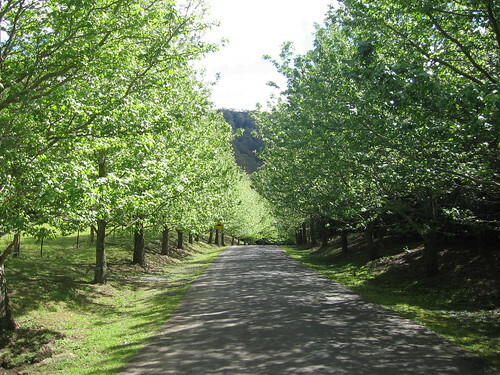 The road outside the small country town of Jamberoo… a tarred strip high on the Illawarra escarpment, set among a line of Maple trees, bordered by a small patch of grazing land and a mountain, and leading all who walk the road closer to their centre. I found this Easter, that simply walking, watching and listening have transformed the known and old into something unknown, new and alive… to be explored in the coming weeks and months… maybe on another walk!